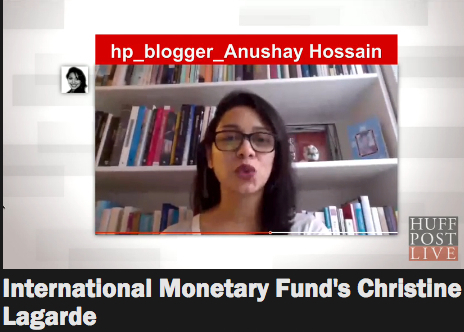 I am still in disbelief that in the middle of her interview on attracting women to the workforce, Arianna Huffington took a recorded question from me for Christine Lagarde today on HuffPost Live. Arianna Huffington is not only my media icon, but the Huffington Post was the first major online platform to publish my work. After posting an article of mine back in 2009, they have taken almost all my submissions. In short, I owe them a lot. They gave my work an audience from day one. I am so lucky to also regularly appear as a guest on their live streaming online channel, HuffPost Live, but today was a very special experience. Although I was asked a few days ago to pre-record my question for Arianna’s interview with Christine Lagard, I almost choked when Arianna tosses to me in the middle of her amazing interview on how to attract women to the workforce. I took the opportunity to ask Lagarde what she thinks needs to be done to make the US workforce more supportive of women with children. 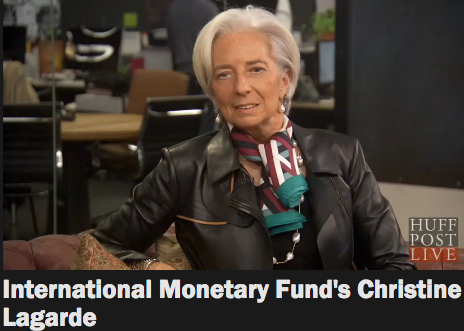 Watch Lagarde take a long pause, ponder and then answer my question here. I come in at 5:54.